Now that we are down to just four months to go until we embark on our once in a lifetime family holiday I am thinking more and more about what food we will be enjoying while away. A few weeks ago I travelled down to London to meet with the lovely Carnival ladies and my fellow Carnival Family bloggers. 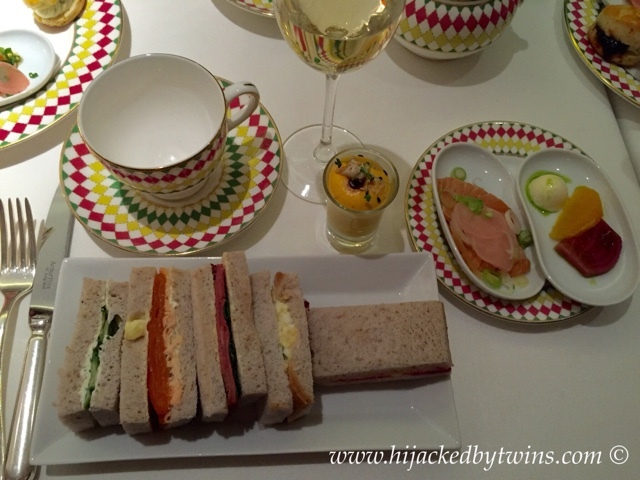 I have got to admit that this was my first afternoon tea and wow, we were in for a treat! 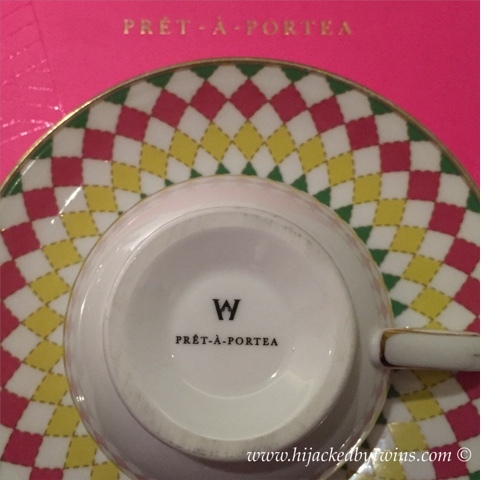 We met up at the luxurious, 5 star hotel, The Berkeley Hotel in Knightsbridge, London to experience their exquisite Pret a Portea fashionista themed afternoon tea. 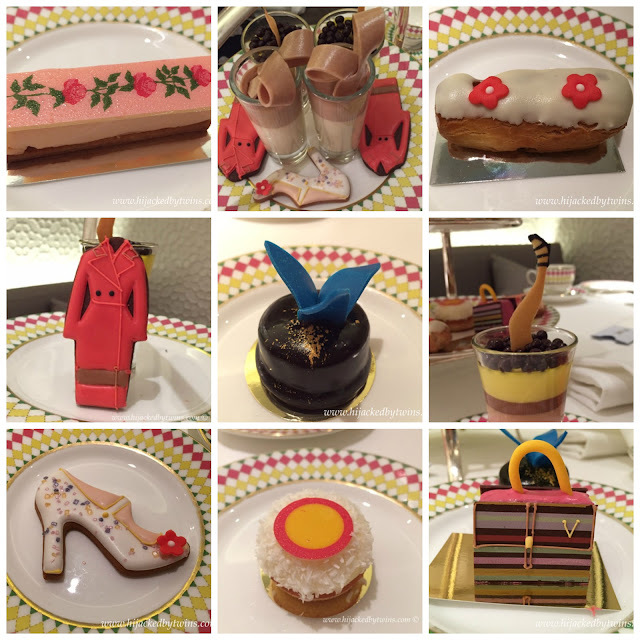 Each of the delicately decorated treats are based on key items from the autumn winter catwalk. From Dolce and Gabana's Viva La Mama collection is the pink rose dress. This has been transformed with a lychee and almond mousse set upon pink pate sable topped with light pink chocolate and a delicate rose detailing. Alexis Mabille's haute couture over sized bow gown has been recreated with a vanilla panna cotta and chestnut cream duchesse satin topped with a large pink chocolate bow. Simone Rocha's cream tulle dress is transformed into a vanilla eclair filled with a salted caramel creme patissiere decorate with red sugar flowers. Fendi's red, double breasted jacket made a perfect chocolate biscuit complete with red and brown icing. Alice Temperley's stunning flutura skirt is transformed into a gianduja chocolate supreme set on sable Breton glazed with chocolate mirroire, sprinkled with edible gold and a bright blue edible flower. Giambattista Valli's pink and yellow pop culture dress is an elegant bavarois with custard cream and chocolate cremeux topped with crisp pearls and a leg tuile. Finally is another favourite, it's the Valentino rockstud stripped Victoria sponge shoulder bad, filled with a cranberry compote between multi coloured striped chocolate, finished with the golden handle and the unmistakable V.
All of these exquisite delights were accompanied with a variety of loose teas, coffee and champagne. Along with fantastic company and cruise talk it was a delightful afternoon. Before the sweet treats arrived we dined on a selection of sandwiches and savoury bites. As if we were not full enough after all of the delicious food and cups of tea and champagne. 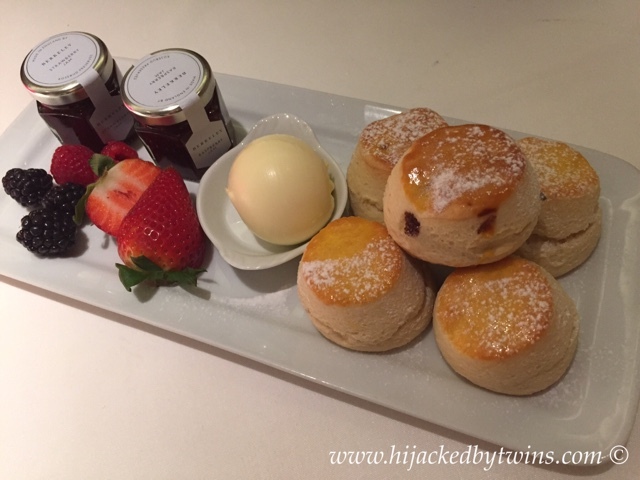 The waiter, once again, tested our restraint by offering fresh out of the oven scones, clotted cream and jam! When we all said that we were full, the waiter genuinely look disappointed. We did not need much persuading to agree to some scones! Now I am going to let you into a bit of a hidden gem of a secret about Carnival Cruise holidays. You can experience what afternoon tea is like while out at sea. Afternoon tea, while over looking the sea view not only sounds relaxing but sounds like a treat not to be missed. Afternoon tea Carnival Vista style will consist of sandwiches, cakes, biscuits and unlimited tea! I know that this will be on our to do list! With only 15 day to go until the launch of Vista the excitement really is building up. With the excitement I have been checking out all of the places to eat and drink on Vista. I have been writing up a list of restaurants and bars that I cannot wait to visit. My plan is to take my list to ensure that nothing is missed! One of the bars that the hubby and I are looking forward to visiting has to be the RedFrog Pub and Brewery. Carnival Vista will have its very own brewery! Carnival will be working in partnership with Concrete Beach Beers to create three distinctive craft beer, Thirsty Frog Port Hoppin' IPA, Thirsty Frog Caribbean Wheat and Frisky Frog Java Stout. I know the hubby and I will enjoy tasting these uniquely brewed beers! I can picture us, enjoying a cold beer, in the sun while the children play a board game or a traditional pub game, getting a bite to eat while taking in the view! Perfect! Next week Friday I will be sharing my meatball recipe as part of my Foodieseeker Friday feature. This recipe is going to be my take on Nonna's Linguine and Meatballs that they serve in Cucina del Capitano. I cannot wait to tell you how I get on and sharing with you how I imagine them to be like. Disclosure: I am Carnival Cruise Line's Foodieseeker Family blogger.